Main House – 3 bedrooms, 1 ½ bath, full kitchen, dining, laundry room with washer/dryer, TV local stations. Sleeps 7+, 2 queen beds, 2 twin beds, and couch. A single air mattress and porta-crib are available upon request. 1 bedroom, 1 bath, Common area with kitchenette (microwave, refrigerator, cooktop) TV – local stations. Sleeps 5+ (1 queen, 2 twins (trundle bed), sofa). A single air mattress and porta-crib are available upon request. 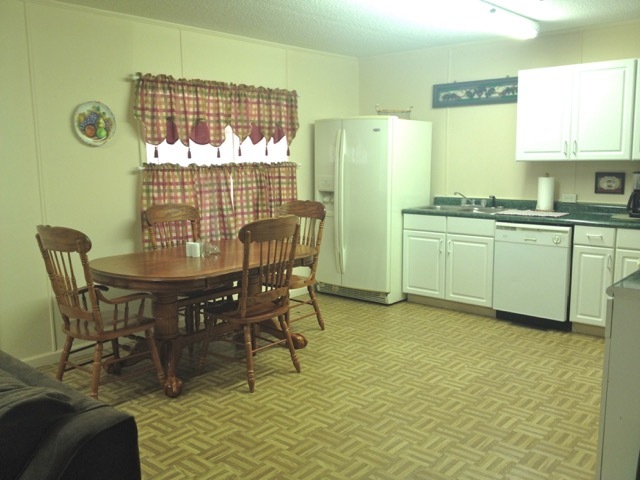 2 bedrooms, 1 bath, full kitchen & dining, den, Laundry room with washer/dryer, TV local stations. Sleeps 6+ (1 queen, 2 twin, sofa bed). A single air mattress and porta-crib are available upon request.